As they once did in their protests against the Vietnam War, American academic historians are now trying to use their positions in academia to present “scholarly” reasons why Donald Trump must not be president of the United States. They have formed a group called “Historians Against Trump” (HAT), since obviously “Historians Against War” was not appropriate for this salvo. I am no fan of Donald Trump, and I am not going to vote for him this election, but their argument does not stand up. First, what if there was a large group of conservative historians in the academy who decided to write an open letter about the election, claiming “the lessons of history” as their reason for arguing we should vote Republican? The HAT would no doubt loudly condemn them for using the fact that they are professional historians with Ph.D.s as the reason they should be listened to…. As a historian who has been fighting this good fight for too long a time, I fully agree with Fish that historians should not as historians be making “political pronouncements of any kind.” In trying to “invest their remarks with the authority of their academic credentials,” as Fish puts it, they are forfeiting the very sine qua non of what being a historian means. The long years of study and the skills they acquired, which earned them advanced degrees, do not come with the right to use those degrees to tell Americans how to vote. Perhaps it passed because it doesn’t actually say that “The AHA condemns this war,” but still… it’s annoying when you discover that you’re still in college, with the student government earnestly passing sophomoric resolutions on your behalf. Wankers. Seven years’ work on Gothic chapel in Paris finished to mark anniversary of birth of Louis IX who commissioned it to house his collection of religious relics. One of the Gothic wonders of the medieval world, the stained glass windows at Sainte-Chapelle in central Paris have been restored after seven years of painstaking work. The restoration was finished to mark the 800th anniversary of the birth of King Louis IX, who commissioned the chapel in the mid 13th century to house his collection of religious relics, including what was believed to be Christ’s crown of thorns and part of the cross. The work involved dismantling the huge windows into small panels and cleaning them with lasers. An outside “skin” of glass has been moulded on to the original windows to protect them from traffic pollution, without altering their look. The chapel is one of the earliest surviving buildings of the Capetian royal palace on the Ile de la Cité, along with the Conciergerie. The two-level building, which was built in just seven years in the 1240s, is a small but spectacular example of the Rayonnant style of Gothic architecture, with little stonework and 15 huge stained glass panels and a rose window added a century later. The 6,458 sq ft of stained glass windows in the upper chapel illustrate biblical scenes from both testaments. Overwhelmingly deep red and blue, they depict 1,130 biblical figures. Salisbury Cathedral, constructed in the early thirteenth century in the newly fashionable gothic style, is one of England’s most splendid. Here it is on a WWII propaganda poster by Frank Newbould, via the Imperial War Museum. Republished under the terms of the Imperial War Museum Non-Commercial License. IWM PST 3640. 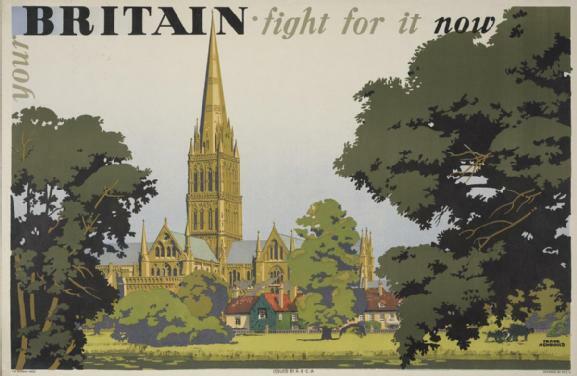 But the cathedral wasn’t always in this Salisbury (“Sarum” in Latin). On top of a nearby hill lie the remains of the former cathedral, designated Old Sarum. Whatever population surrounded this cathedral migrated to the new one over the course of the Middle Ages, leaving the hilltop abandoned. One thing that did not move, however, was the “borough” status of Old Sarum, which continued to send two members to Parliament until 1832 – including, at one point, William Pitt the Elder, later to become Prime Minister. (Disraeli: “England is governed not by logic but by Parliament”). Basically, whoever owned the land was able to nominate both members of Parliament. This “rotten borough” and others like it were abolished in the Reform Act of 1832. The archaeological site of Old Sarum located in Wiltshire, England, has a rich history stretching back at least five thousand years. But it was William the Conqueror’s selection of the site for his royal castle in the 11th century that left the greatest mark on this historic landmark. Now geophysical surveys have revealed that what lies beneath the surface may actually be one of the largest medieval royal palaces ever found, built within the grounds of a vast Iron Age fortress, and hidden beneath fields for more than 700 years. According to a report in The Independent, the high-tech scans carried out by archaeologists from the University of Southampton, including magnetometry, earth resistance, ground penetrating radar, and electric resistivity tomography survey, have revealed the foundations of dozens of houses and an enormous, previously unknown complex, measuring 170 ms (558 ft) long and 65 m (214 ft) wide, which is believed to have been a royal palace. “The prime candidate for constructing it is perhaps Henry I sometime in the early 12th century,” said one of Britain’s leading experts on high status medieval buildings, Dr Edward Impey, Director-General of the Royal Armouries. The complex was arranged around a large courtyard with 3 m (10 ft) wide walls, and included a long building, which was probably a grand hall. There is also evidence of towers and multi-storey buildings. If it is indeed a medieval royal palace, it is the largest of its kind ever found in Britain. Up until now, archaeologists were only aware of the much smaller complex on top of the man-made castle mound. Old Sarum was originally an Iron Age hill fort, built in 400 BC on a site that had been inhabited since at least 3,000 BC. The site was used by the Romans, becoming the town of Sorviodunum. The Saxons also used the site as a stronghold against marauding Vikings. In the 11th century, William the Conqueror, having gained control of England, chose Sarum as the location for a royal castle. The fact that it lay inside a large hill fort meant that defenses could be constructed very quickly. The castle was built on a motte (raised earthworks) protected by a deep dry moat in 1069, three years after the Norman conquest. The construction of a cathedral and bishop’s palace occurred between 1075 and 1092. A royal palace was then built within the castle for King Henry I and subsequently used by Plantagenet monarchs. By 1219, the limitations of space on the hilltop site had become cause for concern, with the cathedral and castle in close proximity and their respective chiefs in regular conflict. The abandonment of Old Sarum by the clergy during the 1220s marked the end of serious royal interest in the castle. The castle continued in use, but was largely abandoned by the 16th century. The biggest travelling exhibition on Ancient Greece ever assembled opens Dec. 12 in Montreal. And the Canadian Museum of History in Gatineau, which will host the stunning exhibition next summer, played a key role in making it happen. Entitled The Greeks: From Agamemnon to Alexander the Great, the show spans nearly 6,000 years of history and features more than 500 precious archaeological treasures from 21 Greek museums. About 300 have never before left the country. After its run at Montreal’s Pointe-à-Callière Museum ends in April, the exhibition will shift to the Canadian Museum of History for four months starting June 5. Then it’s off to the Field Museum of Natural History in Chicago and the National Geographic Museum in Washington, where it will wrap up on Oct. 9, 2016. You can build audiences with exhibitions like this, O’Neill says. “I have every expectation that we will with this exhibition, as well.” The museum expects to attract 150,000 visitors. Pointe-à-Callière is projecting a similar number. The Gatineau museum heads a four-museum consortium that, in conjunction with Greek authorities, organized the exhibition; something it had never done in its 25-year history. How it came to play the leading role is a tale of luck, timing and interests aligning. In the spring of 2012 Jean-Marc Blais, the museum’s director general, raised the idea of a Greek exhibit with Eleftherios Aggelopoulos, then Greece’s ambassador to Canada. A collection of stone objects – sculptures, inscriptions and architectural features – acquired by Lord Elgin from the Parthenon in Athens between 1801 and 1805, during his time as ambassador to the Ottoman Empire, of which Athens was a part. Regarded as one of the world’s greatest cultural monuments. Built nearly 2,500 years ago as a temple dedicated to the Greek goddess Athena, it was for a thousand years the church of the Virgin Mary of the Athenians, then a mosque, and finally an archaeological ruin. By 1800 only about half of the original sculptural decoration remained. Did Lord Elgin steal them? Not according to the British Museum, which says he acted with the full knowledge and permission of the Ottoman authorities, removed about half of the remaining sculptures from the fallen ruins and from the building itself. 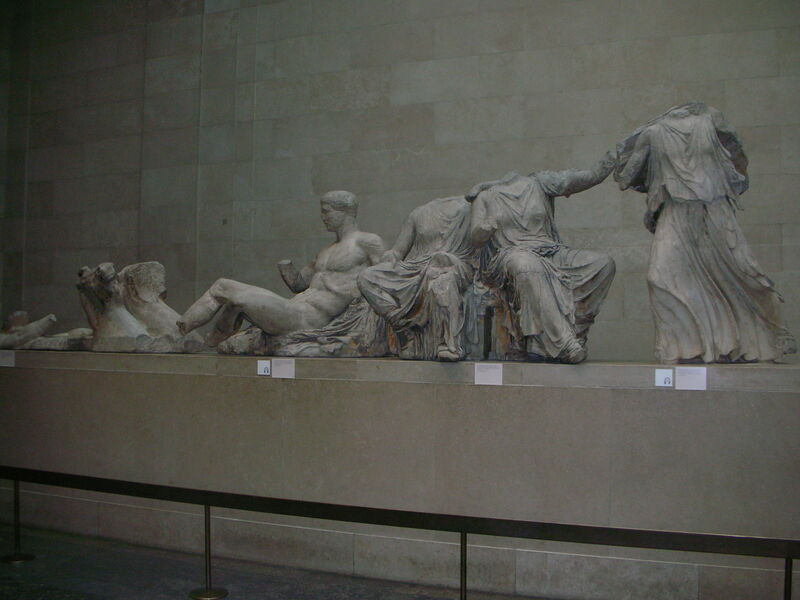 Lord Elgin was passionate about ancient Greek art and transported the sculptures back to Britain by sea. The objects were purchased by the British Parliament from Lord Elgin in 1816, following a Parliamentary Select Committee inquiry which fully investigated and approved the legality of Lord Elgin’s actions. They were presented by Parliament to the British Museum, where they have remained on display ever since. The sculptures are the subject of one of the longest cultural rows in Europe. But the British say that Lord Elgin legally purchased the statues from the Ottoman Empire before Greece won its independence and that it would set a disturbing precedent for major museums if they were returned. Many British historians consider them relics of an Athenian civilisation rather than the modern Greek state. When did the row begin? 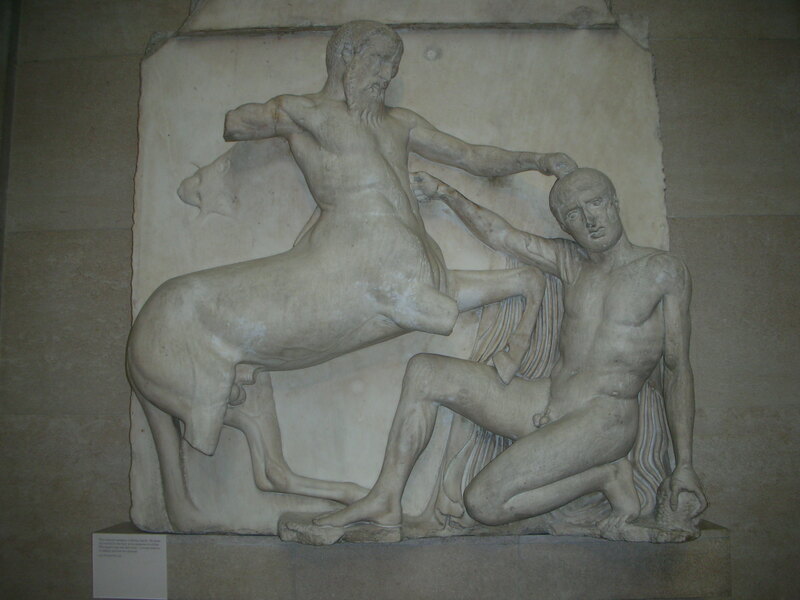 The first serious discussion about returning the Elgin Marbles is said to have been initiated in an exchange of correspondence in a newspaper in 1925, with Courtenay Pollock arguing that the time was right to make the gesture towards Greece. Since then the issue has been raised by the Greek authorities with almost every British ambassador to Athens. 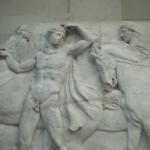 The British Museum says that the Acropolis Museum in Athens allows the remaining Parthenon sculptures to be appreciated against the backdrop of ancient Greek and Athenian history. 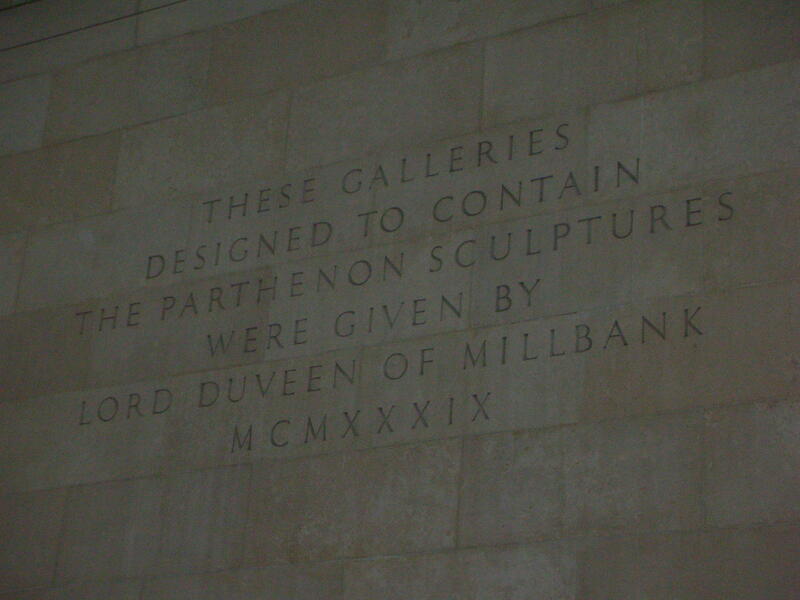 It says the Parthenon sculptures in London are “an important representation of ancient Athenian civilisation in the context of world history”. In October, lawyer Amal Clooney – the wife of actor George Clooney – said Greece had “just cause” for the return of the marbles. 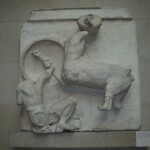 Mrs Clooney, who is part of the legal team advising the Greek government on possible action in the international courts to force the return of the marbles, claimed Britain should be embarrassed for retaining them. However, Neil MacGregor, director of the British Museum, ruled out a return, arguing that they gave “maximum public benefit” by staying in London. The row will only escalate with the lending of the river god Ilissos to Russia. 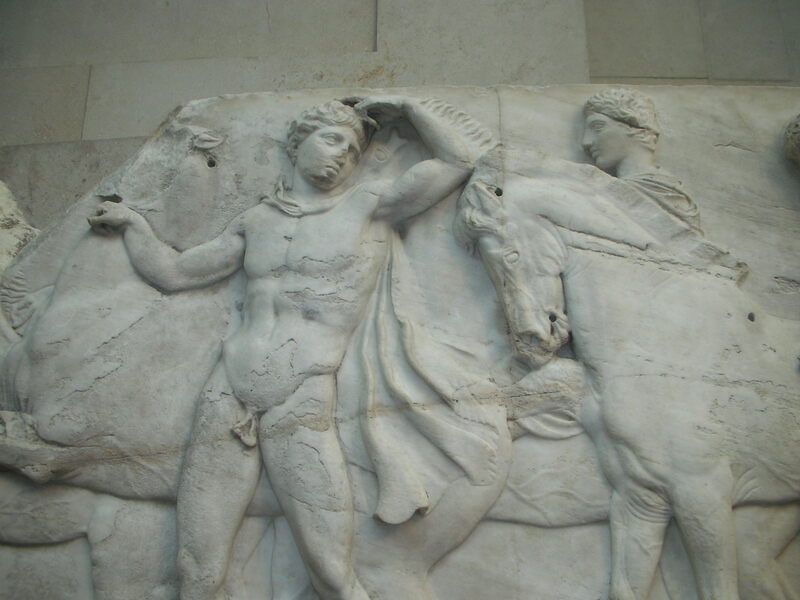 Greece will no doubt be furious that the British Museum is prepared to send part of the Parthenon to Russia but not back to the Athens. What survives of the Parthenon? Roughly half now survives: 247 feet of the original 524 feet of frieze; 15 of 92 metopes; 17 figures from the pediments, and various other pieces of architecture. It also includes objects from other buildings on the Acropolis: the Erechtheion, the Propylaia, and the Temple of Athena Nike. Where can the surviving sculptures be seen? 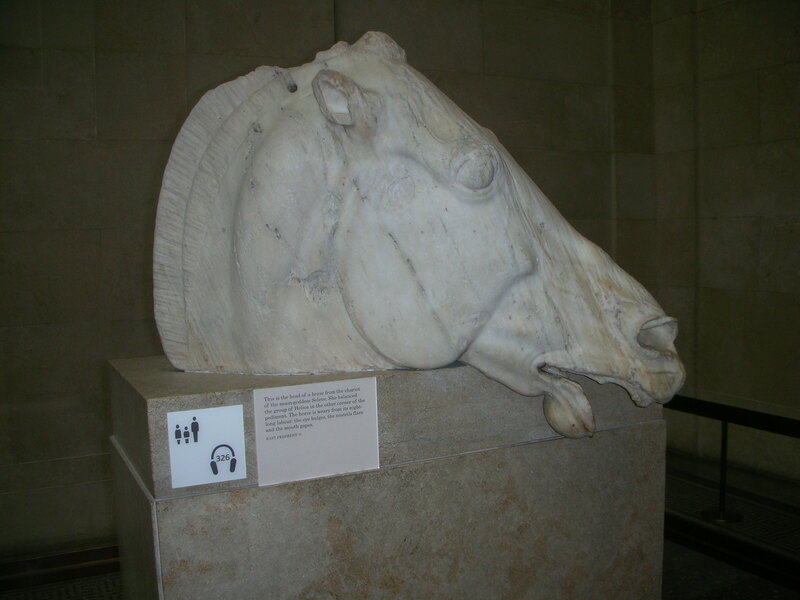 Around 65 per cent of the original sculptures survive and are located in museums across Europe. The Acropolis Museum in Athens and the British Museum in London have about 30 per cent each, while other pieces are held by other major European museums, including the Louvre and the Vatican. 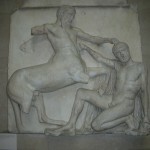 The British Museum also has other fragments from the Parthenon acquired from collections that have no connection with Lord Elgin. I think that one of the keys to this whole controversy is the line that “Many British historians consider them relics of an Athenian civilisation rather than the modern Greek state.” A grad school professor of mine told me once that the ideology of the modern Greek state, founded in 1832 as a result of a revolution against the Ottoman Empire (and the help of the UK, France, and Russia), is that the state is in fact a continuation or reassertion of the Classical polis of Athens. A Greek I once spoke to hinted that he actually believed this. 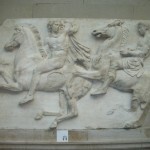 As such, one can see how the Elgin Marbles would assume such an outsized importance – and how any Ottoman treatment of them was completely illegitimate. Such uses of history are hogwash, of course. Why is the modern Greek state not figured as a continuation of the Byzantine state? Or a reassertion of Classical Sparta – or Bronze Age Mycenae? You can’t cherry-pick what you most value from history and ignore everything else that’s happened before and since (apparently Israelis used to practice archaeology on this principle, by shoveling off the Ottoman, Byzantine, Roman and Hellenistic layers in order to get to the Biblical ones that they were really interested in, and which their own state, they claim, is simply a new instantiation of). 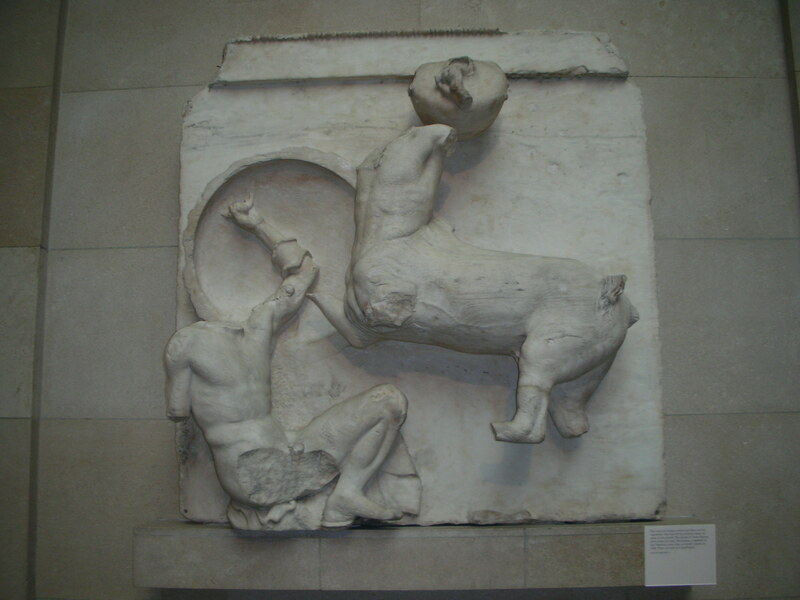 It is amusing to read how the British see the Parthenon as having fallen into ruins – this is a trope in furta sacra (accounts of medieval relic thefts), and employed to justify those thefts. 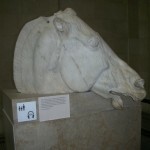 Even the notion that “if they had been left in place, the air pollution in Athens would have damaged them” is not necessarily a watertight argument: when I lived in London a story broke that in the 1930s the British Museum cleaned the sculptures a little too enthusiastically, thereby destroying traces of the original colors used to paint them. 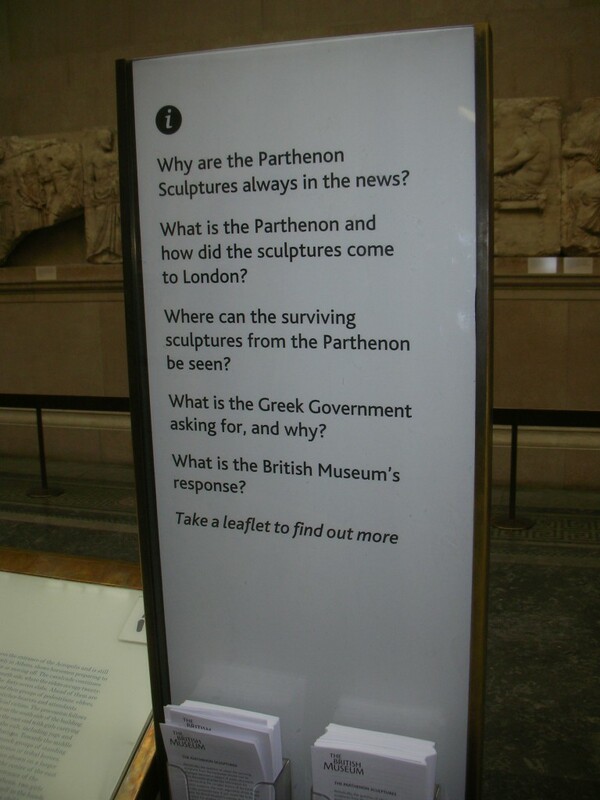 Besides, say the Greeks, when they come back will go into a specially-designed Parthenon Museum, where they will be protected from the climate (my brother-in-law has visited this, and claims they’ve got an empty room all ready for them). 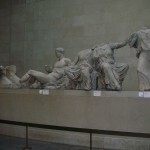 But I think the Elgin Marbles should remain in the British Museum anyway. 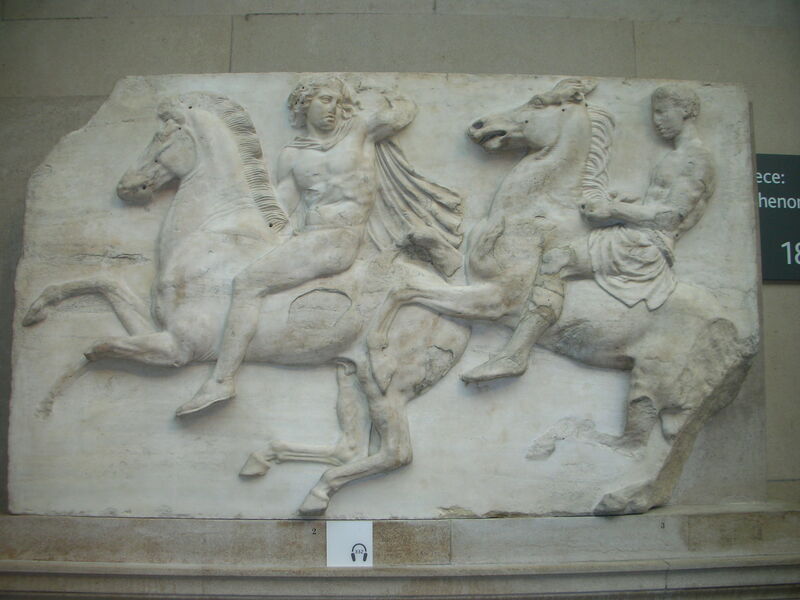 The Marbles do not belong to “Greece”, they belong to all of Western Civilization. And spreading things around geographically is like diversifying your investment portfolio – it helps to guard against the whole thing being destroyed in some disaster. Besides, Greeks, how about some gratitude to the people who helped free you from the Ottomans in the first place?! I took one of these pamphlets but I can’t find it now. The British Museum website probably gives just as much information.